Recent times have seen a shift from completely computer based “in-the-box” live shows to performers making use of the huge amount of powerful hardware gear currently available. Novation’s product specialist Chris “-CALC-“ Calcutt explores the different ways available to create the perfect hardware live set-up and how to realise your studio tracks in the live environment. Using a range of different equipment from both Novation and some other interesting devices, -CALC– will give a full run through of how to take your tracks to the stage, choosing the right gear and sharing tips and techniques that will let you shine out from the crowd. James Dymond has built a career over recent years as one of the UK’s brightest Trance artists. He has productions on labels such as Armin Van Buren’s Armada and is resident on Aly & Fila’s Future Sound of Egypt. James’ production is focused on working within the box yet manages to achieve huge sounding mixes despite not using hardware. He will share his composition and processing techniques within this track build session (Part 1 of 2 sessions today). Expect to learn about his Analog modelling fx chains with plugins and how he creates dance floor damage with his production skill. When an artist hits the creative wall in music creation, and ideas are not easily materialising, it is tempting to take the easy route of preset surfing, or to browse the latest plugin for inspiration. Stefano Ritteri will take steps to dissolve this mind set by sharing some of his fundamental work flow ideas and demonstrate how producers can create totally unique sounds through the power of sound design, reprocessing, sampling and manipulating audio to new heights. He will be using his FX rig , Novation Peak, Clarett USB interface and Ableton Live. Stefano Ritteri is an electroninc music producer and has for the last 16 years been making music under various monikers for labels such as Dirty Bird, Defected, Get Physical as well as engineering and composing music for TV and advertising. This is not to be missed! With so many choices when choosing your studio setup, it is important to get the most out of the gear you choose. Certain instruments offer different work flows as well as sound. Even modest systems can have a wealth of connectivity for artists to utilise, and of course can yield interesting results with modular, drum machines and sequencers. Eastenderz label boss – Eastend Dubs takes us through his synth choices that he uses in the studio when writing and creating his signature sound. 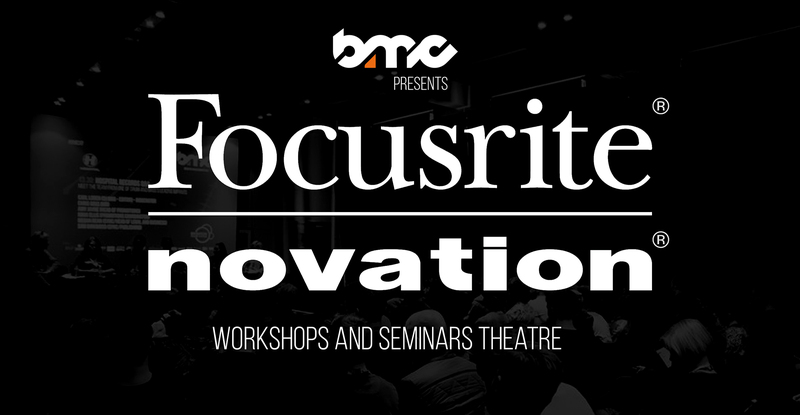 He will be showing users how Novation & Focusrite products feature in his setup alongside many other brands, and how great results happen when creative connectivity comes into play. James Dymond finishes the day with his final track build workshop. The morning session focused on composition and processing, this session addresses mix and arrangement duties. It can sometimes be daunting to turn your vision of a track to a finished masterpiece. James Dymond takes the guess work out of the process and shares vital tips for creating modern, cohesive mixes with emotion. From idea – to dance floor, expect to learn how to get the most out of a simple setup all focused around his Focusrite Clarett USB interface. Alex Arnout has been one of the most significant London-based house artists in recent years. His style encompasses many different sounds, taking inspiration from his extensive record collection and the countless dance floors he has filled for many years. He runs some of the most prolific labels in the UK – Dogmatik Records & DMK Records – who has seen releases from artists such as Peace Division, Jovonn, Maya Jane Coles and Burnski amongst many others. His hardware-based studio is focused around live capture and makes sure that his music creation process is completely free, and at one with the machines he works with, a blurred line between him and the circuits. Alex will take attendees though how he starts from scratch on each track, captures the live session and then arranges something ready for the floor.